Follow new pubs/citations on Google Scholar Citations pages to stay up to date on a field – microBEnet: the microbiology of the Built Environment network. At a recent meeting of the Sloan Foundation program on Microbiomes of the Built Environment I gave a talk about microBEnet and kind of begged people in the program to send me emails when they had new papers out so we could include them in our reference collection and could blog about them. And one person in the crowd (I think it was Rob Knight) said something to the effect of “Why can’t you just get updates on our papers from places like Pubmed and Google Scholar?”. And, well, it turns out, it was a great suggestion. I now have spent the last few months experimenting with better ways to track publications instead of selfishly expecting people to tell me what they are up to (well, this could help them in some ways too but really this was about me and my project and I was asking people to do something for me). One of the best ways to keep up with papers from specific people is if they have a Google Scholar Citations page. 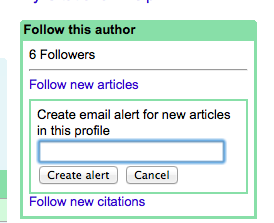 If they do then you can select “Follow New Articles” or “Follow New Citations” from the right hand side of their page and get email alerts whenever they have a new paper added to their page. This is VERY helpful in many cases – especially when authors have somewhat ambiguous names. This is because Google Scholar does a good job of “disambiguating” names and assigning the correct papers to someones Citations profile. Thus for “microbiology of the Built Environment” I have tried to compile a list of Google Scholar pages for authors who work in this area. 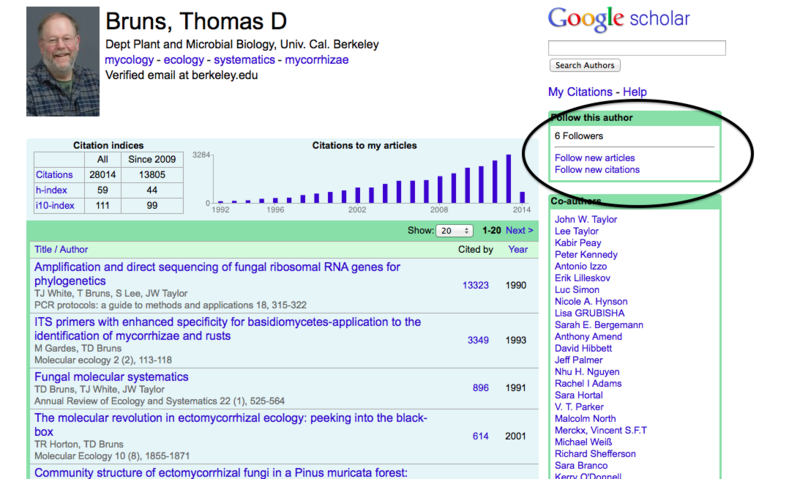 See Google Scholar Author Pages for Researchers Working on Microbiology of the Built Environment. And if you want to stay up to date with the field, or with specific authors in this field, here is what you do. Select one of the author’s from the list. And then you should get a menu to fill in your email address to subscribe to either new papers or new citations to papers. 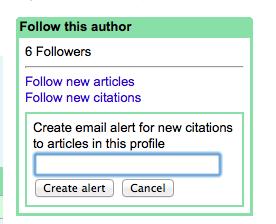 And voila – if you do this for a few authors you can get automated updates of their new papers. Now – everyone is drowning in email of course – so what I do is add gmail filters for these notices so that they get put in a folder and not in my inbox.